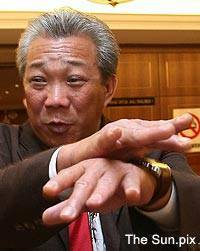 This idiot of a Barang Naik party backbencher Bung Mokhtar Radin is at his worse again! Never mind he had insulted all female Malaysians including his grandmother, mother, wife, sister, daughter and every female relations of his, when he made that famous ‘bocor’ statement in Parliament last year, now he has insulted our intelligence. Follow the story and you can choose whether to get mad at him too. Then this ‘bocor’ MP told TheSun outside the House that he did not make the gesture, described as the ‘palm hitting a clenched fist’. Can you really believe that he hit his palm on the back of his other hand instead of a clenched fist? Which also reminds me that Barang Naik party VIPs are prone to obscene gesture of this kind. Remember that MB of Pahang, Adnan Yaacob? See lah the video below. * If you are not a subscriber of malaysiakini (only RM150 a year, approximately 42 sen a day), you can read the complete story here. Bung has swear to take up the Obor and become the joker of parliment. Bro, tell me what new about this? what to do, MEREKA MASIH LAGI KERAJAAN but not for long i hope? His explanation was so lame that I didn’t need video proof to know he was lying his guts out. what type of people usually behave like this and it is understandable?….. lets say guys who are samseng, gangster, tarik kereta, along… who else?